This blog is about my flying all around Europe for business and fun. In the following posts I will describe my longest flying journey so far from Slovenia to Bulgaria and then from Bulgaria to Finland and back to Slovenia. Back in December 2008 when I was attending UKOUG conference in Birmingham, UK, I was invited by Milena Gerova, The president of Bulgarian Oracle Users Group (BGOUG) to present at their spring conference which takes place at the end of April at famous Bulgarian ski resort Pamporovo. At the same time I was also invited by my friend Tuomas Pystynen from Miracle Finland, who is also a member of OakTable network, to present at “May Day” event which is organized just before Finish national holiday May 1st in Helsinki. So the challenge to fly whole trip by myself was there. As it was a few days between those two events I would have enough time to fly from Bulgaria to Finland even in case that the weather wouldn’t be ideal and I would have to make several stops. It was obvious that this trip will be the most challenging not just because of still pretty unstable weather at the end of April but also due to crossing so many countries. Some of them are quite "exotic" (for aviation) and not very favorable for general aviation like Bulgaria and Romania. My preparations started more than two months before the actual flight took place with general planning of the route and determining the requirements for flying in certain countries. The plan was to fly from one Slovenian international airport to Plovdiv(LPPD) in Bulgaria which was only about hour and half driving away from the BGOUG conference venue Pamporovo. This part included flying over Croatia, Bosnia and Serbia. 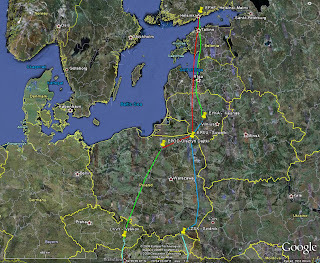 The second part of the trip would be from Plovdiv to Helsinki-Malmi (EFHF) in Finland crossing Romania, Hungary, Slovakia, Poland, Lithuania, Latvia and Estonia with refueling stops in Slovakia and northern Poland. The last part of trip was return from Finland to Slovenia. Part of the way back home was the same as the route to Finland – from Helsinki through Estonia, Latvia and Lithuania to Poland with a refueling stop there and then through Czech Republic through Austria and Hungary back to Slovenia. I have more than 20 years of experience in working with Oracle products. I began in 1988 with Oracle Database version 4 while working for the City of Ljubljana, where I had charge over the city's municipal and geographic information systems. More recently, I have specialized in performance optimization, having developed my own tool set for monitoring performance and analyzing trace files. In addition to sharing my knowledge through conference talks, I am conducting technical seminars organized either by Oracle University or myself. I am very proud of two highly respected memberships: OakTable network in 2005 and Oracle ACE in 2009 and Oracle ACE Director in July 2010. When not working with Oracle products I enjoy flying as private pilot (PPL(A) with night rating) with my Mooney M20E year 1966, call-sign G-ATOU. Prior Mooney I had an old Piper PA-28-140B Cherokoee, call sign D-EHFK and I have crossed almost all Europe with her.